Spin Master has put out a ton of different RC cars made after Cars 2 movie characters under the Air Hogs brand, but this one, coming out in October 2011, looks like it may be the most advanced yet. In fact, it may be one of the most sophisticated toy-grade RCs, period! Before getting into its special features, let me mention some important things about its construction. The main body is very thick. It's made of a type of plastic that's pretty firm, so it feels like it's built to last, but there is just a little bit of flexibility so if it gets dropped or crashed, it's not so likely to suffer cracks or chips. The wing feels slightly more flexible still, which is good because that seems like the most vulnerable part. The wheels have very nice detail, but the slick racing tires are more impressive still. The rubber is solid, but a little sticky. I would like to see them used on faster RCs made for bigger kids, as they feel like they'd have outstanding traction. The experience of turning on the Air Hogs Real Lightning McQueen car for the first time left me literally in disbelief. When it's off, it looks like just any ol' car, except styled to look like the Cars 2 movie character. Well-constructed, but just a toy. When you turn it on, fake eye details on the windshield actually retract away from view, and the entire windscreen lights up brightly with full-color, fully animated eyes. It's an actual screen, like a tiny TV panel. The mouth also lights up and animates. The car also has a voice, and talks to you. Even if you just leave it sitting there, the eyes will blink and the car just seems alive. It's pretty impressive, but it gets better. The controller doesn't have an on/off switch. Instead, it has a three-position knob with "off," "race," and "rookie" settings. Race mode is actually what would typically just be labelled "on" -- it lets you drive the car around normally. As you drive the car, The Real Lightning McQueen will say things appropriate to what he's doing, and even give encouragement, like "All right!" as he goes or "That was a tight corner!" Again, the mouth moves when he talks, and when you steer, the eyes also look in the direction the car is going. My favorite thing, which I forgot to get on video, is when you crash. A comical metal crashing sound comes out of the car and McQueen says either "Ouch!" or "Hey, watch where you're going!" After enduring too many hard hits, McQueen will stop driving and audibly call for a pit stop. Realistic pit stop sounds will play, air wrenches & all, then he'll go back to normal operation. "Rookie" mode is really interesting. Instead of you telling the car what you want it to do, it tells you what it wants to do. McQueen's voice will say "Back it up," "turn left," "turn right," etc. If you miss a command or go the wrong way, he'll say so, followed by, "Let's try that one again." The car also drives a little slower in rookie mode. It just seems like a good way to keep a kid occupied, at least for a few minutes at a time. Switching between rookie and race mode is very easy since it's done from the controller, and the selector knob is large and easy to turn. The only unfortunate thing about rookie mode is that the car doesn't have any way to sense the environment around it, so if you don't have plenty of open room around you, it'll eventually ask you to steer it right into a wall or piece of furniture. There's no paint on the front of the car, though, so running into things with the slightly yielding plastic at least shouldn't cause any marring or damage to objects around the house. It's also not fast enough to really hurt little feet, even in a full-speed collision. 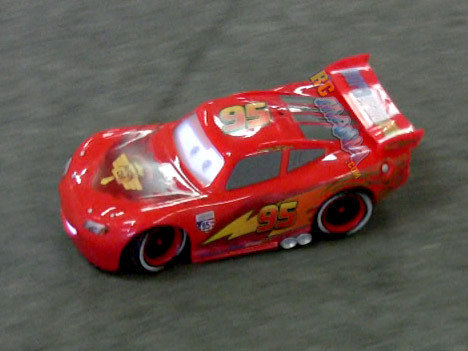 The Real Lightning McQueen RC car from Air Hogs is one fine toy. It brings a much-needed, well-welcomed injection of technology-driven interactivity to the RC world to help keep the iPad/Xbox/smartphone generation of kids moving and playing with something real instead of solely sitting down staring at an LCD screen throughout all of their free time. My biggest gripe with the car is honestly that the infrared control setup keeps kids from taking their play outside. Other than that, a pretty solid, innovative, positive toy.